JEMMA KIDD NOURISHING TINT// Since I have been off school, most days I have just been reaching for this as it is a really nice tinted moisturiser that just evens out my skin and adds a bit of coverage. Plus the best thing about this was that I found this for only £3 in my local Factory Shop. I would highly recommend going into one near you as they are a great place to find bargain beauty products! BARE MINERALS LASH DOMINATIONS// Oh my gosh this stuff makes my lashes look so voluminous. I love the packaging and the lid is twisted so it is really funky when you twist the top off and the brush is massive, like possibly the biggest mascara brush I own. There's no fallout but it can clump a bit if you keep reapplying it and layering too much. TOPSHOP JEWEL LIPSTICK// A did a review on this lipstick in May and somehow it ended up forgotten about at the back of my draw. Whilst having a tidy up I found it again and now I remember why I love it so much. This lipstick lives in my bag because I know I can throw it on and it will give me a really natural pink colour that is noticeable but nothing extreme. Also what I love most is that it stains my lips and leaves such a pretty stain a while after you apply it. I have a review here if you fancy reading more! REAL TECHNIQUES EXPERT FACE BRUSH// Whilst I have been away this brush has been a life saver because I can literally do everything with it: foundation, concealer, powder, bronzer and blush. The brush is so soft and the perfect size for my face - I don't know what I would have done without it! BARRY M GELLY HI SHINE ROSE HIP// I have worn loads of different polishes this month, but this one is one of my favourites that I wore. It is an off white pale pink that actually looks quite bright on my nails. I love the gelly formulas and this one looks so glossy on my nails. When I held my nails to the light you could just see how glossy it was! 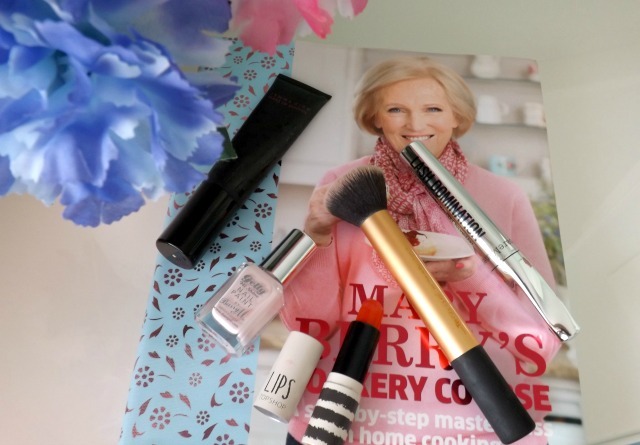 MARY BERRY// In my eyes Mary Berry is the Queen of baking, every recipe of hers that I have tried have turned out beautiful and I love that her baking is old fashioned. She has true grace and elegance and I think it is amazing a women of her age is so active and she is great on the bake off! This month I have baked her Lemon Drizzle Cake and her Victoria Sandwich (recipe here!) several times and both have been delicous and huge people pleaser's! I really ant to try the Bare Minerals mascara! This post has given me a nudge and more reason to go out and buy it! I love your blog and have been reading it it for a while! Now I have just followed you on Bloglovin!